The JMG Tennis Academy at Arden Hills in Sacramento has scored a coup with the addition of coach Elena Likhovtseva. The 42-year-old Russian quietly enjoyed a decorated 17-year career (1992-2008) on the WTA tour. Likhovtseva (pronounced Lee-HOFF-seh-vuh) reached highs of No. 3 in doubles (2004) and No. 15 in singles (1999). She won 27 titles in doubles and three in singles. The slightly built Likhovtseva captured two Grand Slam mixed doubles titles (Wimbledon in 2002 with Mahesh Bhupathi of India and the Australian Open in 2007 with Daniel Nestor of Canada), reached four major doubles finals, and advanced to the singles semifinals of the 2005 French Open. In addition, Likhovtseva played on Russia's 2004 Fed Cup championship team, was a three-time Olympian and helped the Sacramento Capitals win four World TeamTennis titles in her nine years on the club (1999-2008). She was named the league's Female MVP in 2005. "She's almost like family for us," former Capitals owner Lonnie Nielson told The Sacramento Bee in 2007. "She's been around so long, and we enjoy having her on and off the court. She's one of the nicest players I've ever met." Likhovtseva stayed with Nielson's mother-in-law when the Capitals played at home. JMG, founded and owned by Joseph Gilbert, has produced junior national champions Collin Altamirano, Jenson Brooksby, Austen Huang, Karl Lee, Zachery Lim, Priya Nelson and Rudy Quan and sent numerous players to Division I universities on scholarship. Altamirano, who in 2013 became the first unseeded player to win the USTA boys 18 national championship, helped the University of Virginia win the NCAA team title in all three of his years there before turning pro last year. Fourth-seeded Raquel Atawo of San Jose and Anna Lena Groenefeld of Germany beat unseeded Nicole Melichar of Stuart, Fla., and 42-year-old Kveta Peschke of the Czech Republic 6-4, 6-7 (5) [10-5] today to win the Porsche Tennis Grand Prix in Stuttgart, Germany. Atawo (formerly Kops-Jones) won her 18th WTA doubles title and first with Groenefeld. Atawo was born in Fresno and starred at Cal, winning the 2003 NCAA doubles title with Sacramento native Christina Fusano. In the Stuttgart singles final, fifth-seeded Karolina Pliskova of the Czech Republic downed wild card CoCo Vandeweghe of Rancho Santa Fe in the San Diego area 7-6 (2), 6-4. Pliskova and Vandeweghe, both 26, combined for three runner-up finishes in the Bank of the West Classic at Stanford. Pliskova lost to Angelique Kerber in 2015, and Vandeweghe fell to Serena Williams in 2012 and Madison Keys last year. The Bank of the West Classic will be replaced by the Mubadala Silicon Valley Classic, July 30-Aug. 5 at San Jose State, after 21 years at Stanford. The Stanford women were ranked 46th, the lowest position in program history, when Pacific-12 Conference play on March 9. Then the Cardinal got healthy and finished 9-0 in conference matches. Stanford continued its momentum in the Pac-12 Championships, beating UCLA 4-2 today in Ojai for its third consecutive conference title and 14th straight victory. Stanford received an automatic berth in the NCAA Tournament, which begins May 11 at regional sites. The selection show is scheduled for Tuesday at 2 p.m. PDT. The Cardinal leads all schools with 18 NCAA women's national championships. Florida is next with seven. Stanford (18-3), seeded first in the Pac-12 Championships and ranked 16th, rallied after losing the doubles point against the Bruins, seeded second and ranked 13th. Emily Arbuthnott, a sophomore from England ranked 51st, clinched the Cardinal's victory by topping Abi Altick, ranked 59th, 4-6, 6-1, 6-1 on Court 4. Stanford's Michaela Gordon, a freshman from Saratoga, lost at No. 1 doubles and singles. No. 6-ranked Terri Fleming and Jada Hart edged No. 2 Arbuthnott and Gordon 7-6 (6). Then 14th-ranked Ena Shibahara outlasted the 16th-ranked Gordon 6-1, 1-6, 6-4. UCLA's Alaina Miller, a junior from Saratoga who uses two hands on both sides, won at No. 3 doubles but lost at No. 6 singles. Miller and Shibahara defeated Melissa Lord and Janice Shin 6-4. Emma Higuchi beat the 117th-ranked Miller 6-4, 7-6 (5). In the men's final, top-seeded UCLA defeated third-seeded USC 4-1. The Bruins' Logan Staggs, a senior from Tracy ranked 86th, was tied with Thibault Forget, the son of former world No. 4 Guy Forget of France, 6-3, 3-6 on Court 4 when the match was abandoned. Staggs, a 5-foot-9 (1.75-meter) left-hander, did not play doubles. The NCAA has placed the Sacramento State men's and women's tennis programs on three years' probation and imposed other sanctions for numerous violations over a five-year period. "Many of the violations, and the most serious, resulted from the misconduct of a former director of women's and men's tennis programs," the NCAA said recently in a news release. "The former director took advantage of a permissive compliance environment and engaged in intentional conduct that violated a broad range of NCAA rules, including recruiting, eligibility, financial aid, benefits, coaching staff limitations and ethical conduct. "After the university did not renew the scholarships of two women's student-athletes, the former director provided or arranged for a booster to provide tuition for them. The former director routinely provided student-athletes and prospects impermissible housing arrangements, free tennis instruction and facility use at a local tennis club he owned and where the tennis program conducted most of its activity. ... "
The violations occurred during the tenures of tennis director Bill Campbell, women's head coach Dima Hrynashka and men's head coach Slava Konikov. All have left Sac State. Hrynashka and Konikov hail from Belarus. Konikov now coaches former world No. 1 Victoria Azarenka, as he did when she was a child in Belarus. The tennis club mentioned in the NCAA release is Rio del Oro. Seniors Alina Soltanici of Moldova and Deimante Bulatovaite of Lithuania sat out the 2017 regular season because of the NCAA investigation, Sac State spokesman Andrew Tomsky said last April. Soltanici played No. 1 singles for the Hornets in 2016, and Bulatovaite played primarily No. 3 or 4. Hrynashka went 168-96 (.636) overall and 85-4 (.955) in the Big Sky in 10 seasons at Sac State and was named the Big Sky Conference Women's Coach of the Year five times (2008-11 and 2013). The Hornets women won 13 consecutive Big Sky tournament titles from 2002 to 2014 and lost in the first round of the NCAAs each time. They won one point total in their last five NCAA appearances. Konikov guided the Hornets to six Big Sky tournament titles in his 12-plus years at Sac State, each resulting in an automatic NCAA Tournament berth and first-round loss. Maria Sharapova hopes her stay in the San Francisco Bay Area this year lasts longer than it did last year. The five-time Grand Slam champion and former world No. 1 has entered the inaugural Mubadala Silicon Valley Classic, organizers announced today. The tournament, scheduled for July 30-Aug. 5 at San Jose State, replaces the longtime Bank of the West Classic at Stanford. After winning her first-round match at Stanford last year, the right-handed Sharapova withdrew with soreness in her left arm. That followed a thigh injury in the third tournament of her comeback from a 15-month doping ban. Sharapova, who will turn 31 on Thursday, is ranked No. 42. She has played in only three tournaments this year, reaching the third round of the Australian Open and losing in the first round at Doha and Indian Wells. 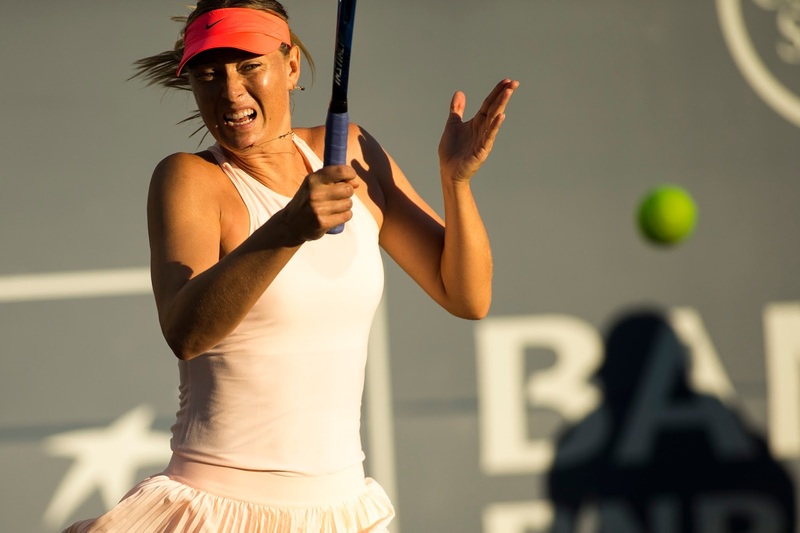 Sharapova withdrew from the Miami Open last month with a left forearm injury. Sharapova completed a career Grand Slam by winning the 2012 French Open. She is one of only six women to achieve the feat. This will be Sharapova's fifth appearance in the Bay Area tournament. She reached the 2010 final, losing to Victoria Azarenka. Sharapova joined 2017 champion Madison Keys and runner-up CoCo Vandeweghe in this year's 28-player field. Former Cal teammates Andre Goransson and Florian Lakat edged Scott Griekspoor of the Netherlands and Yannick Mertens of Belgium 2-6, 6-2 [10-7] today to win the 2018 Spell Restaurant Men's $25,000 in Memphis, Tenn.
Goransson, a 23-year-old Swede, and Lakat, a 22-year-old Frenchman, were seeded first. Griekspoor and Mertens were unseeded. Goransson won his second consecutive doubles title and Lakat his third. They claimed the $25,000 Calabasas (Calif.) title late last month, and Lakat took the $25,000 Gatineau (Canada) crown with ex-North Carolina All-American Ronnie Schneider of Bloomington, Ind., in early March. In the Memphis singles final, the top-seeded Griekspoor topped sixth-seeded Sebastian Fanselow, a former Pepperdine All-American from Germany, 6-7 (3), 6-4, 7-5. Northern California juniors earned two more titles on Saturday in the USTA International Spring Championships in Carson. Zachery Lim of Fairfield won the boys 16s singles championship, and Katie Volynets of Walnut Creek claimed the girls 18 doubles crown with Natasha Subhash of Fairfax, Va. Twins Allura and Maribella Zamarripa of Saint Helena took the girls 16s doubles title on Friday. Lim, seeded third, whipped fifth-seeded Maxwell McKennon of Newport Beach 6-0, 6-2. Lim, 16, did not lose a set in his five tournament matches after receiving a first-round bye. He dropped only three games in the semifinals. The third-seeded Volynets and Subhash beat fifth-seeded Georgia Drummy of Ireland and Alexandra Vagramov of Canada 6-3, 6-3. Volynets, 16, won the Easter Bowl 18s singles title last week at Indian Wells. Allura and Maribella Zamarripa of Saint Helena in the Napa area on Friday won their second big junior doubles title in two weeks. Six days after winning the Easter Bowl girls 16s at Indian Wells, the unseeded Zamarripa twins took the USTA International Spring Championships crown in Carson. They beat fourth-seeded Maryam Ahmad of Albertson, N.Y., and Lina Mohamed of Glen Cove, N.Y., 6-2, 6-4. Meanwhile, third-seeded Zachery Lim of Fairfield knocked off top-seeded Spencer Brachman of Commack, N.Y., 6-0, 6-3 to reach the boys 16 final. Lim will meet fifth seed and Easter Bowl runner-up Maxwell McKennon of Newport Beach. Third-seeded Natasha Subhash of Fairfax, Va., and Katie Volynets of Walnut Creek advanced to the girls 18 doubles final with a 5-7, 7-6 (5) [13-11] victory over top-seeded Margaryta Bilokin of Ukraine and Elizabeth Mandlik of Delray Beach, Fla. The match ended abruptly when Mandlik received a point penalty for throwing her racket, Colette Lewis reported at Zootennis. Subhash and Volynets, 16, will face fifth-seeded Georgia Drummy of Ireland and Alexandra Vagramov of Canada. Volynets, seeded ninth in singles, lost to Drummy 6-1, 6-4 in the third round after winning the Easter Bowl singles title in the 18s. San Francisco native Sam Querrey defeated Ruben Bemelmans 6-1, 7-6 (5), 7-5 today in Nashville, Tenn., to give the United States a 2-0 lead over Belgium in the Davis Cup quarterfinals. The 6-foot-6 (1.98-meter) Querrey, ranked 14th, pounded 21 aces and won 83 percent of the points on his first serve (45 of 54). Bemelmans, ranked 110th, had nine aces and nine double faults. Earlier, ninth-ranked John Isner beat No. 319 Joris De Loore 6-3, 6-7 (4), 7-6 (8), 6-4. The 6-foot-10 (2.08-meter) Isner, who won the biggest title of his career on Sunday in Miami, hammered 43 aces and won 84 percent of the points on his first delivery (74 of 88). Both De Loore and Bemelmans have played in Northern California in recent years. De Loore, 6-foot-3 (1.91 meters) and 190 pounds (86 kilograms), ousted top-seeded Bjorn Fratangelo in the first round of the $100,000 Stockton Challenger in 2016 before losing to eventual runner-up Noah Rubin. The following week, De Loore reached the semifinals of the $100,000 Fairfield Challenger. Bemelmans, a 6-foot (1.83-meter) left-hander, won the $25,000 Burlingame Futures in 2016 and lost as the first seed in the opening round of the $100,000 Tiburon and Stockton Challengers last fall. Belgium, the Davis Cup runner-up in 2015, is playing without veterans David Goffin, ranked 10th, and Steve Darcis, ranked 143rd after reaching a career-high 37th last May, because of injuries. The United States can advance to the semifinals for the first time since 2012 with a victory in Saturday's doubles match (2 p.m. PDT, Tennis Channel).